Thanks everyone for making it out to Rockstar Energy Drink US#HighlandShowdown this year. We were able to raise more than $2500 for Grind For Life, Inc., I appreciate you all for making this an awesome event! Thanks to everyone who helped us close out the year with a bang at Lakeland for the last stop of Grind for Life this year. The Annual Awards are this week on Thursday. Watch for the 2018 schedule out soon. Trap Nate's video recap and Chaz's photos are below. The 9th stop of the Grind for Life Series Presented by Marinela is in the books. GFL is a national series of all ages contests in both bowl and street. At the end of the year, we recognize the top skaters in each category at the Annual Awards in Tampa. Check the Season Ranking's update here. Trap Nate has the video recap and Chaz has photography from this stop below. We learned something at this stop: skateboard contests on a Tuesday aren't going to be super packed. We figured in Souther California when schools out, Tuesday would be like a Saturday, but it wasn't. Oh well, there was still a good crew of you that came to have a good time and that still went down. Check Nate's video recap and Chaz's photography here. We'll see you at the next stop in Bradenton in a couple months. Find out more about Grind For Life, and all ages, all skills national skateboarding contest series, at GFLSeries.com. Super BIG Congratulations to GFL Supporter and Team Rider Alex Sorgent for Winning X GAMES Gold ! Alex skated in the gflseries.com for the first 8 years of his skateboarding career, which started at age 5. The Grind For Life Skatepark Series gives skateboarders like Alex the opportunity to learn how to compete and be a part of something positive and healthy. Thanks to everyone that came to the third stop of the year at Payne Skatepark in Sarasota, Florida. The second stop of the season is in the books for the Grind for Life Series Presented by Marinela. Check the current rankings here. Thanks to all 154 of you that entered, and the 54 of you that skated GFL for the first time. We hope you had as good of a time as we did. Check out some photos and a video recap below. The Grind for Life Series is a national, all ages and skills series benefiting the Grind for Life Organization, a 501(c)(3) non-profit that assists cancer patients with travel expenses. 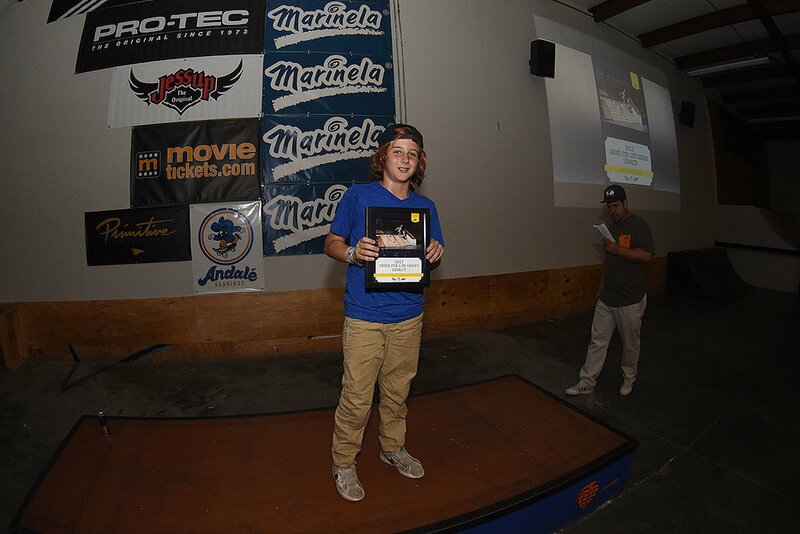 This year's first stop was in New Smyrna, Florida where 144 entries went down in 14 divisions in bowl and street skateboarding. GFL Skateboarding events have given out $14,100.00 dollars to help people travel long distance for treatments . Very nice work everyone, thank you . Grind for Life has held over 20 skateboarding events where we educate and inspire cancer patients and families concerning cancer survival and recovery with Mike Rogers story. Mike Rogers is a two time Sarcoma survivor. Hundreds of GFL t shirts and GFL Decks have been given to cancer patients and survivors in 2016. Grind for Life would like to thank everyone so much for all their help and support in 2016. For the past seven years, before Santa delivers toys and gifts, he’s been breaking away to catch some waves in Cocoa Beach on Christmas Eve morning. Pretty cool, right? New this year, the crowd can participate in a costume contest. Dress up in your favorite winter themed outfit – snowman, Santa and Mrs. Claus, gingerbread man, reindeer, elves – for your chance to win prizes.